"Water World," the 1995 multi-million dollar futuristic saga about a planet Earth with no dry land, may have bombed at the box office, but a decade later it can seem strangely prescient. At the very least, events over the past year have left many of us floating in a sea of uncertainty, searching for any safe harbor. Water, water is everywhere, from the putrid non-potable toxic gumbo that engulfed New Orleans, to tidal waves along Asian coastlines, massive floods in Central Europe, ice storms along the U.S. East Coast, and even snow in the Arabian Desert! While the impact on our physical geography is perceptible, less obvious is the concurrent transformation of our inner landscape, the subtle expansion of the boundaries of our collective consciousness. The December 26, 2004 earthquake/tsunami was one of the greatest natural disasters in recorded history. While not the deadliest quake (the earthquake in Tangshan, China, in 1976 is rumored to have killed 750,000) it was distinctive in its global reach. Tidal waves washed ashore in thirteen countries, and mass tourism during the holiday season affected citizens of dozens more. 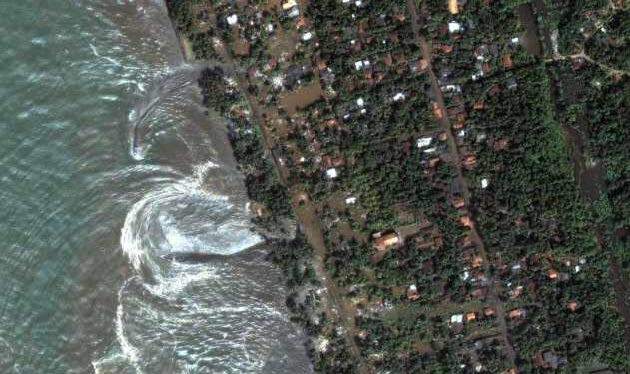 An aerial photograph of the wave that attacked the shore of Sri Lanka appeared in a Japanese newspaper the following day. (See below.) 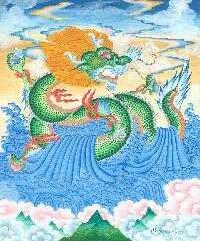 A figure resembling a dragon can clearly be seen in the waves. An article entitled "Rampage of the Dragon God" accompanied the photo. In Japan, the dragon has long been worshipped as the god for water. Similarly, in Chinese mythology, dragons are charged with controlling the rains. Since time immemorial, across all cultures, natural disasters have been ascribed to the anger of one or another of a whole host of gods. In fact, following the recent tragic hurricane that hit the Gulf States, callers to Christian talk radio stations in the area (remember, it's part of the Bible Belt) were calling for residents of New Orleans and Biloxi, both havens for gambling, to repent. Clearly, in their belief system, the wrath of God was an operative cause of the disaster. While many look heavenward for answers, astrologers are especially adept at assigning such causality. As above, so below. These are times of great upheaval, in large measure because we are transitioning between two Great Precessional Ages, Pisces and Aquarius. The "Dawning of the Age of Aquarius" has been a much-anticipated event, since the 1960s musical Hair proclaimed that peace will guide the planets and love will steer the stars. In the year 2000, the appointed hour should surely have arrived; however, the promised Golden Age of peace, love and brotherhood was nowhere to be found. The energy of the New Age has indeed arrived, just not according to our naive expectations. The cusps between Ages are so fluid, that the period of transition can be decades (some say centuries) long. Mankind is on a lengthy transformational journey, but we are still like kids in the back seat of the car asking "Are we there yet?". How do we move beyond the old paradigm of Pisces, a dualistic world-view in which God is outside of us and we are separate not only from Him (patriarchal, male) but from each other and all of nature? In such a world it is acceptable to operate with impunity, disregarding the needs of others, the creatures who share this planet and even the Earth herself. How do we grow to embrace a new holistic paradigm in which the entire universe, our planet, and we ourselves are all connected, where we are one with our fellow beings and stewards of the Earth? We can't get there from here. But, we have gotten our learner's permit and are now being thrust behind the wheel. We would do well to take our attention off the rear-view mirror and move forward deliberately. Crises force us to reexamine our beliefs and change our behavior. The Chinese symbol for "crisis" is composed of two characters--danger and opportunity. Cataclysms are catalysts. They sow the seeds of change. With Uranus in Pisces, change is in the air. It's also in the water. Since this planetary ingress in 2004, water-related disasters have increased in number, scope and intensity. Uranus is the harbinger of the Age of Aquarius, and, as such, seems to have a proprietary stake in advancing its agenda. As a higher octave of Mercury, Uranus, mythological ruler of the heavens, is sometimes called the "voice of God." He is howling in the wind and whipping up the waters. What is his divine message for mankind? Obviously, something is in the water, and at least one scientific researcher thinks that he has found the answer--consciousness! Japanese scientist Dr. Masaru Emoto has become a kind of New Age darling since his photographs showing the effects of human emotions on the crystalline structures of water appeared in the movieWhat the Bleep Do We Know. His book The Hidden Messages in Water promotes an eye-opening theory showing how water is deeply connected to people's individual and collective consciousness. Using high-speed photography, he found that water crystals reveal changes when exposed to specific thoughts, music, visual images, written words and photographs. Emoto theorizes that since water has the ability to receive a wide range of frequencies, it can also reflect the universe in this manner. Emoto also believes that since people are 70 percent water, and the Earth is 75 percent water, we can heal our planet and ourselves by consciously expressing love and goodwill. Feng Shui, which translates literally as "wind and water," is an ancient Chinese system for achieving balance and harmony with the environment. It has its roots in the Chinese reverence for nature and belief in the oneness of all things. Good Feng Shui ensures a healthy flow of ch'i, the breath of life, or life force. The massive storms that we are seeing during the current hurricane season are also wind and water--pushed to extremes--perhaps by a fire-breathing dragon! Ocean temperatures are rising dramatically due to global warming, one causal factor in the ferocity of storms. Dr. Emoto, who published the photograph above on his website, theorizes that pollution of the environment has angered the dragon god of water and unleashed a storm of vengeance. There are critical messages in the water. The dragon is one of the most prolific images in the wider mythological world--a wild animal, creator, destroyer and divine entity in one. With its untamed spiritual abilities and complex system of associated symbols and metaphors, the dragon spans mythological boundaries to encompass the good, the bad, and the downright evil. Dragon's blood is considered to embody vitality, ch'i energy. The dragon's mythical and religious relationship to snakes and serpents bestows upon it a transformational, Plutonian archetype and relates it to the Plutonian cycle of death and rebirth. Astrologers use the dragon's head and tail (the Moon's nodes) in a natal chart to symbolize the individual's potential to transmute negative karma. Some cultures sacrificed virgins to dragon gods to ensure fertility. In the Western mind, fire dragons have long been associated with death and destruction. In the East, dragons--especially water dragons--are also considered to be protectors and creators. Perhaps this is because water is seen as creative and life-bearing. In Greek and Roman mythology the ocean was the womb that nurtured the love goddess, Venus/Aphrodite. She was spawned by the seed of Uranus' dismembered phallus, cut off by his son Kronos/Saturn and tossed into the sea. Allegorically, despite the appearance of useless death and destruction, Uranus is using contemporary, water-driven events to plant seeds in the sea of the collective consciousness. After a lengthy gestation, a new birth, that of the much-touted millennium of love and peace, will emerge from the depths. Astrologers have created many elaborate systems for predicting future events. Prediction, however, is still an inexact science. Often timing and potentials are accessible, while content remains speculative. Useful tools in locating "hot spots" are a good ephemeris and some tracking software that can plot transits to transits and/or transits to key natal charts like that of the United States-or your own. To whit, in the Mountain Astrologer ("Uranus in Pisces and the 2004 Tsunami,"Apr/May 2005), associate editor Ray Grasse published a watchlist of flashpoints that could potentially erupt. Some didn't; however, he hit a big one -- August 27-29th of 2005. On those dates, transiting Uranus was in exact square to the U.S. natal Uranus. We now know, in hindsight, that hurricane Katrina struck in that timeframe. Yet, predictions, even if widely known, are not always prescriptive. Katrina's landfall was predicted in advance by weather reports-but the real disaster, the bungled response, was not. It was praric Waboa, given the circumstances. However, foreknowledge concerning the historic indifference and subsequent incompetence of the authorities was withheld from the general public, or ignored. Nonetheless, predicting events in order to avoid or avert catastrophe is a fruitless exercise in the face of advancing karma. Uranian events defy prediction because the element of surprise is essential. They are designed by some higher authority to wake us up! Astrologer Bernhard Bergbauer has hypothesized that "we may soon have the opportunity to predict such disasters before they happen and not just see their significance in hindsight" ("Charting the Tsunami," in the Mountain Astrologer, Apr/May 2005). From my perspective as a karmic/evolutionary astrologer (not your typical breed), the main goal is extracting the significance. Evolution is built on lessons. Each hurricane, flood and tidal wave is uniquely instructive in its impact. The individual stories are written in the charts. An examination of the event chart for the December 26, 2004 tsunami (see last page) will serve as an example. In the tsunami chart, a descriptive symbolic picture of the event is readily apparent. Naturally ruled by Aquarius, the eleventh house is a focal point, containing as it does a stellium in philosophical Sagittarius, inviting us to rise above our separate national identities and perceive ourselves as citizens of the world. 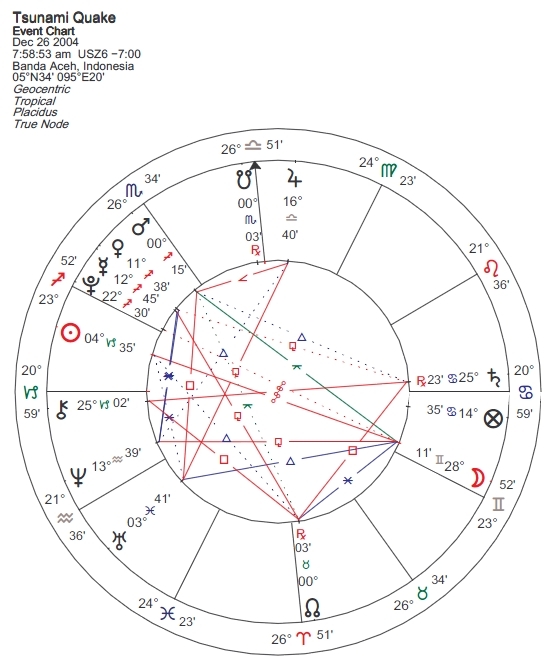 The strong connection (dispositor) of Venus to the Libra Midheaven speaks about emerging possibilities for global cooperation. The empowerment of the United Nations (currently the only institution with a stated Aquarian mission), hitherto crippled in its effectiveness by power struggles among members advancing narrow self interests (South Node in Scorpio conjunct the Midheaven), would be a welcome result. Even Mars, at zero degrees (a new beginning) of Sagittarius is urging a redirection of energy to this cause. In light of the destructive force of nature, war is appearing more and more senseless (Uranus square Mars). Transformational possibilities are expressed through the potential integration of the points of this chart's grand cross on the angles. A Saturn/Chiron opposition squares the Nodes (an out-of-sign aspect). With Saturn as catalyst, the massive death and destruction (South Node in Scorpio in the 10th) and visible suffering of the victims (Chiron on the Ascendant) are clearly meant to shift the basic foundation of our values (North Node in Taurus in the 4th). The North Node is always the resolution point of a cross. The other tidal wave, massive humanitarian aid, was the largest such response in recorded history (Uranus in the 2nd). The generosity of millions worldwide was stunning. Doubtless, we will also see profiteering, greed and corruption (already common practice in many of the affected areas) flowing from these events (South node in Scorpio). However, revelations of such activities also raise consciousness. Capricorn rising confers rulership of the chart to Saturn -- a clear geocosmic signature for a karmic event. The Lord of Karma provides lessons for our spiritual evolution. When gentler hints fail, he brings out the big guns.The tsunami was one bigger-than-usual cosmic two-by-four, needed to wake up the whole world. Saturn's rulership supports the supposition that individuals who were directly affected were making good on pre-incarnation soul contracts. The Gemini Moon (the people) in the sixth house suggests that these myriad souls, from all walks of life, performed a vital public service. In Cancerian fashion, they energized a wave of compassion felt around the world. The plight of these so-called "victims" created an opportunity for us to experience our relationship to each other as one human family. By building on this foundation we may honor their sacrifice. Broad karmic implications must be considered, not to diminish the horrific human dimensions of the tragedy, but rather to add perspective. Karmic law, in its most simplistic form, is often misunderstood as punitive. Rather, karma is the catalytic force that drives the evolution of consciousness forward--both personally and collectively. Progress is generally disruptive, as the old gives way to the new. Many traditions have pointed to these times as apocalyptic. The Hopi prophesied disaster based on mankind's lack of spiritual attention to the world. The Mayan calendar pinpoints the "end of the world as we know it" in 2012. These themes are echoed by Biblical Revelations as well as by various New Age channels. The tsunami earthquake, a massive shifting of the earth's crust, is a dramatic yet eerie metaphor for the Shift of the Ages, as well as for the subtle shifts in consciousness that are presently occurring. In times of disaster it is human nature to ponder that "something good could come of this" -- the proverbial silver lining. In fact, a great deal of bonding, cooperation, love, compassion and renewed spirituality do accompany every such occurrence. The larger cosmic truth is that we are co-creating these disastrous events intentionally (albeit unconsciously) as opportunities for heart-opening emotional and spiritual expansion. In the aftermath of such events, foundations are laid for new structures. As values and priorities shift, individuals and groups are transformed. More opportunities await. Uranus will be in Pisces until March of 2011, and Neptune exits Aquarius just a month later. Until then, we can expect water-related events to impact our evolving consciousness and bring us closer to the world of the future. The Aquarian model is utopian, egalitarian and humanitarian. The Age of Aquarius is one in which science and spirituality are merged, God no longer exists outside us but within us, and we are not separate from each other, from the cosmos-or from the dragon-god consciousness in the water! We are evolving into unity consciousness, and moving the frontiers of human experience forward into previously uncharted waters (pun intended). These trends are the waves of the future, and although they will inevitably ebb and flow, they are the transformational undercurrents that will carry humanity forward toward the promise of a brighter tomorrow. Copyright © 2005 by Judith Goldberg. All rights reserved. Judith Goldberg is a Karmic/Vocational Astrologer with a private practice in Baltimore, Maryland. She is a graduate and Associate of the International Center for Creative Choices, www.creativechoices.com. For information about her services, you may contact her at judith.goldberg@ verizon.net.